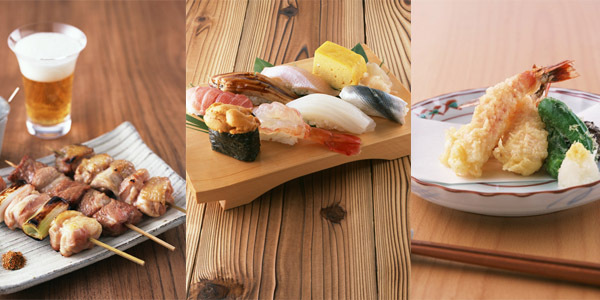 Traditional Japanese cuisine "和食（Washoku）" is expected to be added to UNESCO's Intangible Cultural Heritage list in December 2014. Simply I am honored to hear the news as a Japanese person. It means our traditional and national cuisine is admitted to the world. The Japanese government submitted an application for listing washoku in March 2012, calling it "a social practice based on an essential spirit of the Japanese 'respect for nature.'" The features of Japanese foods are a beautiful appearance, making the most of natural flavors, well-balanced and healthy, and having strong ties to social events and customs. In the period of the Samurai, before the Meigi era, it is said that Japanese people were not allowed to eat meat, or pork because animals with four legs were thought to be evil. Japanese people didn't have the custom to eat beef and pork in the past, that's why Japanese like eating seafood. From Japanese traditional architecture or temples, it envisions the important Japanese spirits; " simplicity" or "humility". The minds may come from the dogmas of Zen. Japanese cuisine is very simple to look at but actually is delicate and there is more to it than meets the eye. It takes time and trouble to cook, as there are many techniques in it. As for Sushi or Tempra, the method of cooking looks so simple, putting seafood on a rice ball or deep frying, but it is said that it takes 10 years for one to be a fully-fledged chef. It's simple but greatly profound! It seems Japanese restaurants are very popular even in many foreign countries. But actually in many restaurants some menus are different from the one we Japanese are familiar with. It's good that many foreign people learn about Japanese foods, but sometimes we come across some Japanese menus which we can't call the Japanese style at all. For many people in the whole world to enjoy Japanese cuisine, we have to make more efforts to spread Japanese foods and spirits. In the end, coming to Japan is the best way to enjoy Japanese cuisine! !